Aurora 48 is a compact and thin profile full-color LED sequencer. It’s built entirely with surface mount components, so the profile is nice and clean. Each LED can be faded in 7 bit per channel – 2,097,152 colors. The circuit is relatively simple and straightforward. 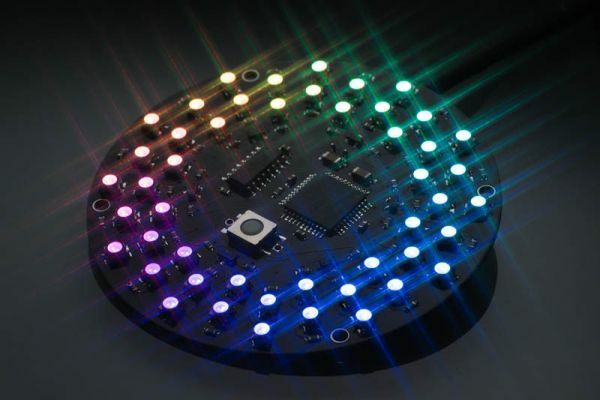 If you’ve seen other LED matrix type circuit, this should look familier.In a nutshell, the 48 RGB LEDs are divided in two groups, connected in a 6:1 multiplex fashion, taking R, G, and B as bus lines, and common pin of each LED as column lines. There are two pairs of R/G/B buses. Since there are only 3 PWM outputs available on the controller used, I used a binary decoder IC to multiplex the PWM signal, to drive 6 bus lines. 3 pins are used to select one of the 6 buses, and 24 pins are used to control LEDs’ common pins.The controller activates one bus at a time, outputs a pulse to the LED that should be lit. The actual duration that a particular LED turns on is controlled by the PWM pulse that goes into the binary decoder, 74HC238. The controller sends PWM pulses as short as 62.5 ns to as long as 12,500 ns to control the brightness. Assembly is very much straightforward, that is if you are familier with surface mount soldering. Please don’t be discouraged – surface mount soldering is not difficult and can be done without special equipment. There are many instructables and YouTube how-to videos showing how to solder SMDs. With a little practice you can solder SMD very easily.Since the PCB doesn’t have silkscreen indicating the parts, use the part placement guide provided to locate the spots for the parts.Start with the center of the PCB and move outwards – 74HC238 and PIC24FV16KA304 would be the first ones to solder. Be sure to apply good amount of flux to the parts to be soldered. Move on to resistors, capacitors, transistors.